Way back in November 2007, we location-enabled all of our Google Maps for mobile clients to bring location awareness to the masses and improve the local search experience. Using My Location, millions of you have been able to easily find yourselves on a map at the touch of a button. But what about finding other people? Lots of you have been requesting to see where your friends are on a map, too. Well now you can with Google Latitude. Latitude is a new feature of Google Maps for mobile, as well as an iGoogle gadget, that allows you to share your location with your friends and to see their approximate locations, if they choose to share them with you. You can use your Google account to sign in and easily invite friends to Latitude from your existing list of contacts or by entering their email addresses. Google Talk is integrated with Latitude, so you and your friends can update your status messages and profile photos on the go and see what everyone is up to. You can also call, SMS, IM, or email each other within the app. Check out the video below to see Latitude in action. On your mobile phone: visit google.com/latitude from your phone's mobile browser to download Google Maps for mobile with Latitude. We currently support most of the popular smartphone platforms: Android, Blackberry, Symbian S60, and Windows Mobile, and we are hoping to see Latitude on the iPhone soon. It will be available through Google Mobile App, and you'll just need to download or update the app from the App store to find Latitude in the Apps tab. On your computer: go to http://google.com/latitude from your browser and add the Latitude gadget to your iGoogle homepage. What's neat is that if you've installed Google Gears or if you're using Google Chrome, you can choose to automatically share your location from your laptop or desktop computer -- no smartphone required! 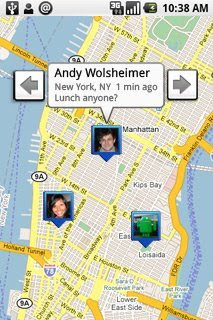 Latitude gives you control over how much or little location information you want to share, and with whom. And of course Latitude is 100% opt-in. Learn more about using Latitude and its privacy features in our Help Center or check out our privacy video. Oh, and I almost forgot to mention - it is available in 27 countries and 42 languages. See in which part of the world your friends are now!